Princess Cheryl's thought of the day:- ...finally, but with much obstacles... miracle is not easy to happen. Am damn sure about that! Surprise? Yep this is Sapa!! We were at Bella Vista Restaurant for dinner. Nice environment for a candlelight dinner. 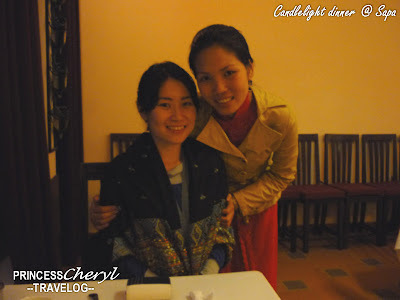 Candlelight dinner in Sapa??!!! Yes why not. =) If you think Sapa is only about villages and trekking then you're wrong. We even received a welcome card on a specially decorated table. Ahem... "Welcom" instead of "welcome"... Special menu for us. The temperature was only 14degC that night. Thus I bought a handmade shawl from the shop opposite my hotel to keep myself warm. No kidding, I couldn't stand the cold by wearing only my jacket and long sleeves. 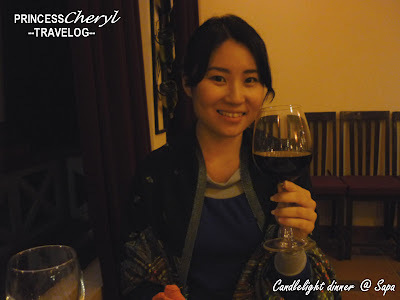 What could be better than a glass of wine to fight the spring night's cold weather? Enjoying the dripping of thick Vietnam coffee...nah I was half playing and half drinking. Then came the soup, spicy and sour shrimp stew. Some weird vege that I've never eaten here in Malaysia but taste darn good! Maybe it's freshly plucked in the afternoon. And I was kind of surprised that they served french fries as one of the dishes!? Maybe F-R-E-N-C-H is the key... These people were so much influenced by the French. Beef saute with lemon grass and chili. This one is our favourite!! Can we get beef that taste this good again.. No doubt the Vietnamese are really great in cooking beef. Grilled pork with lemon leaf. This one not bad too. But still I like the beef better. Our second dinner served in fusion style, plus a candle to add some romantic atmosphere. My Vietnam coffee. Taste as heavy and as thick as an Espresso. One sip enough to drive you high. F-R-E-N-C-H again. They call this french cake. Trying out the local wine. Our waitress. I think she's lovely and sweet thus asked her to take a photo together. And if you wonder what's the entertainment after dinner at Sapa, mine was online! Actually I was replying dozens of emails...still working during vacation! WORKAHOLIC..